Schools are considered as the temple of learning. However, a Delhi student turned it into a battleground after he attacked his teacher with an iron rod which he was reportedly carrying in his school bag. 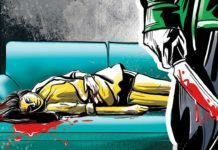 Reports suggest that the accused was identified as a Class 8 student. As per reports, the shocker took place in South Delhi’s Saket area on Saturday. The student reportedly attacked the teacher after she had scolded him for not getting his textbooks and over irregular attendance. The incident took place early morning on Saturday and the Delhi Police was informed about the same at around 9:30 am. According to reports, the teacher had asked the student to take out his textbooks. Later, when the student said that he did not bring them, the teacher scolded him in front of the whole Class and further lashed out at him for being irregular to the school. The investigating police officer added that the accused student had come to school after a gap of several days and was scolded for not getting the books. Next articleFast Not For Karwa Chauth But For Regularization of Their Services.